Camping Apollonia is a campsite in the village of Plakias at the south part of Crete, located just 100 meters from a sandy beach. 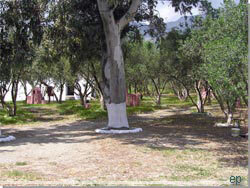 The biggest section of the campsite has sites with natural shade for your tent or your campervan. Among its facilities are a swimming pool, a mini market, a snack bar, Wi-fi, toilets, showers, children's pool, children's playground and basketball court, cooking and laundry facilities open to public.